Welcome. 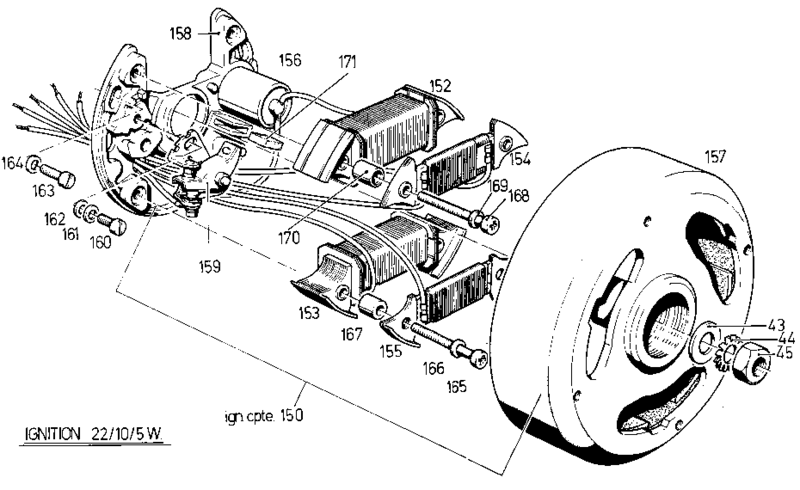 The magneto has two separate functions, 1) produce sparks for ignition, 2) produce electric power for lights. 1) Ignition Pulses: The magneto produces precisely timed pulses, which are transformed into sparks by an internal or external coil. 2) Lights Power: The lights power is normally 6 volts alternating current (6V AC). Normally the correct bulbs are used, and none are burned out. But under certain circumstances the voltage can be less, like 3 volts, or more, like 10 volts. 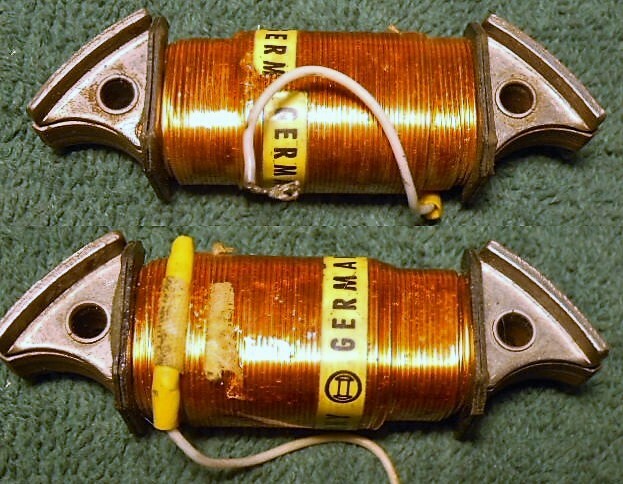 When two or more bulbs share the same generator wire, and one of the bulbs burns out, the others will get an over-voltage, like 8 or 10 volts, become instantly bright and soon burn out. The total watts of the bulbs has to match the watts of the generator, for the voltage to be 6 volts. If the bulb watts is more, then the voltage is less so the light is dim. Bosch makes magnetos with extra generator coils, one for each light, to eliminate the over-voltage and under-voltage problem. 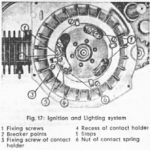 Magneto-Generator History: Moped magnetos changed as moped lights changed over the years. In the 1960’s not many countries worldwide had laws about the brightness of moped lights or the placement of switches and buttons. 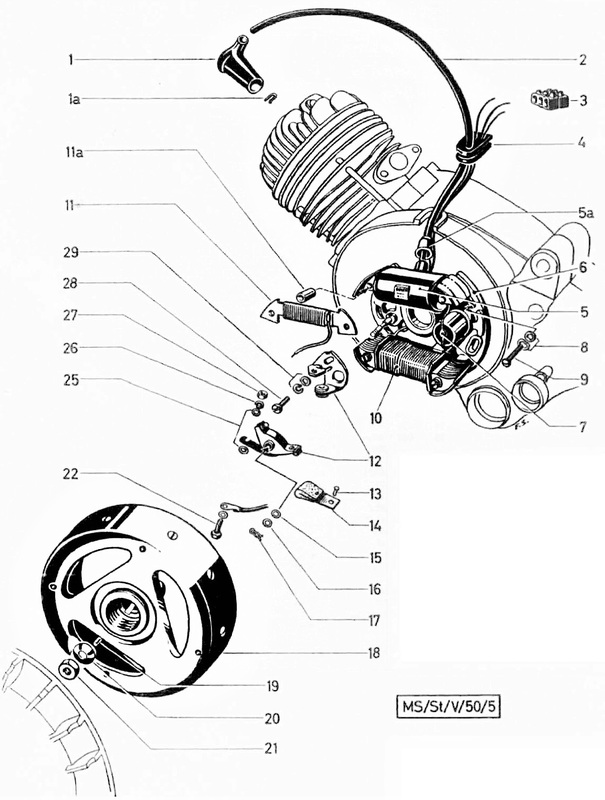 Mopeds did not have brake lights or extra generator coils for them. 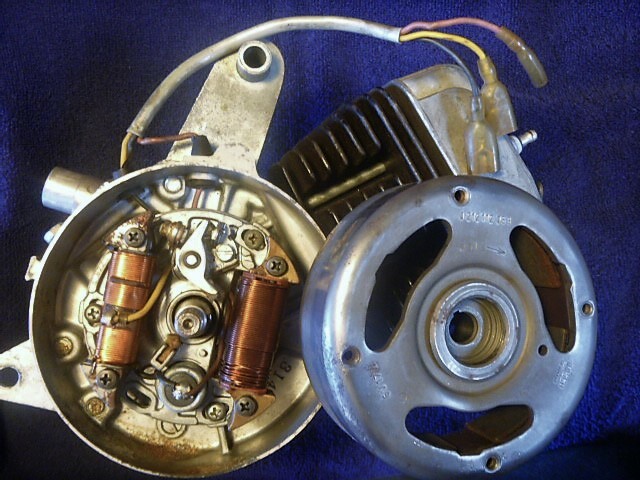 A typical 1960’s moped had a 15 watt headlight and a 2 watt tail light, both powered by the same 17 watt generator coil. Starting in 1972, the USA adopted safety standards for motorcycles and motor-driven cycles (Mopeds had not been defined yet). Lights, rims, brakes and tires had to be US DOT approved. Tail lights had to shine to the sides. Engine stop switches/buttons had to be reachable by the right thumb, while horn and light switches had to be reachable by the left thumb. Switches and fuel petcocks had to be labeled and say what they do. Brake lights were required. Then in historic 1976 the USA adopted safety standards specifically for mopeds and motorized bicycles. The brake light had to be brighter (at least 10 watts) and not cause the headlight to get dimmer. 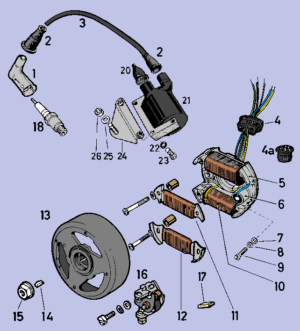 Internal and External Ignition Ground: To supply the required independent brake light power, there were two solutions. 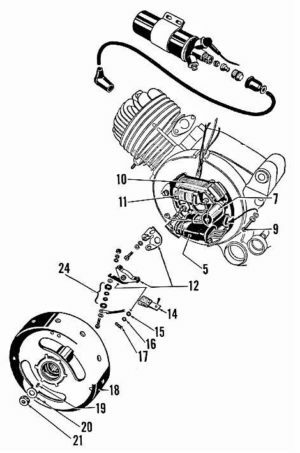 1) Internal Ignition Ground, where the ignition source coil internal ground was kept the same, and an extra generator coil was added or 2) External Ignition Ground, where the ignition source coil internal ground was relocated to outside of the engine and used as a brake light power source. 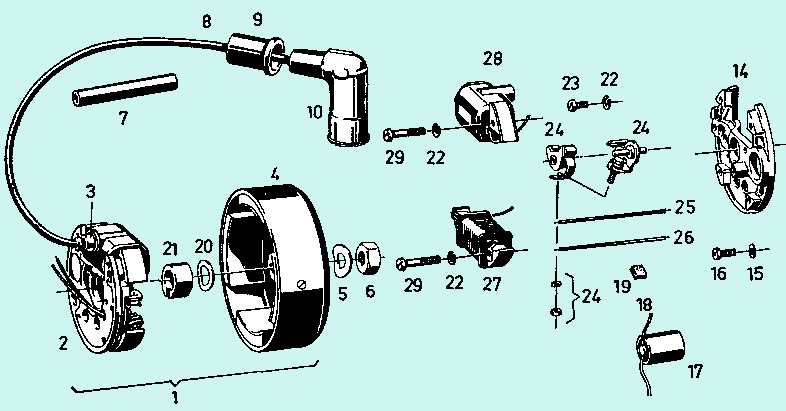 Bosch made both magneto types, in both sizes 80 and 90 mm. Over 200 quality Bosch magneto parts attended the reunion. The 80 mm “small” ones are left, the 90 mm “big” ones are right. Not shown, the many engines and bikes the used parts came from. It don’t come easy. Parts catalogs list the bike maker part numbers, but most do not also give the component maker part number. 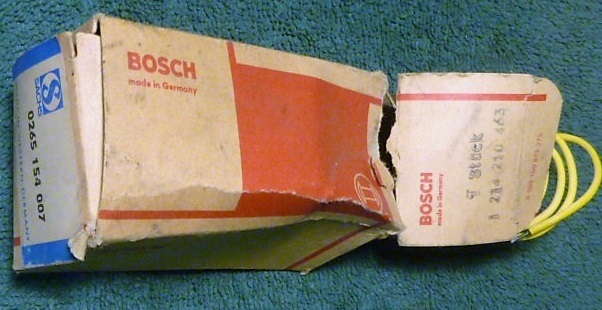 Bosch coil part numbers come from the packaging of new coils. Sometimes empty ripped-up original boxes are pieced back together, to get the part number translation, such as Sachs-to-Bosch. 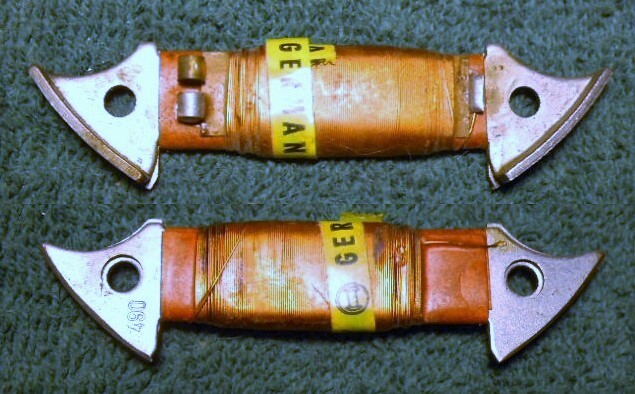 1970’s-80’s armatures also have the last 3 digits stamped on. Bosch stator part numbers are on the back of the base plate. The first 7 digits are cast in, the same for all. 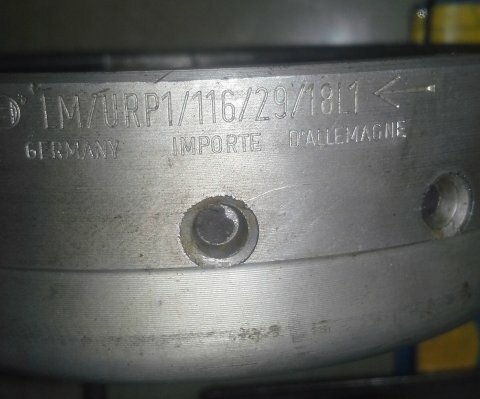 The last 3 digits of the stator assembly part number are stamped on by the factory when the coils are attached. 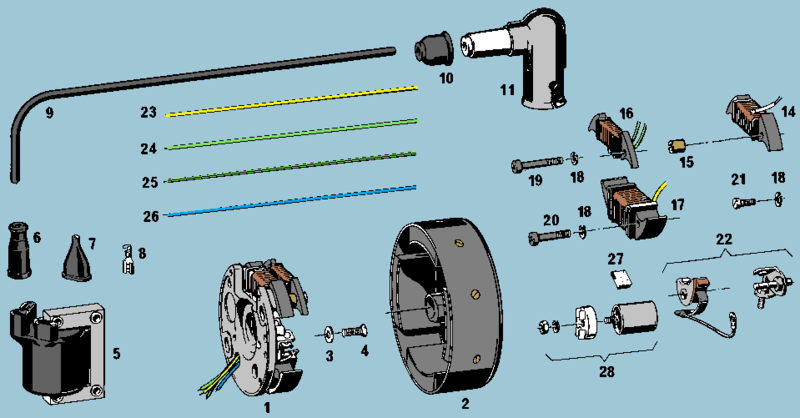 Bosch stator identification: Each engine has a different and unique rubber grommet for the wires to pass through. 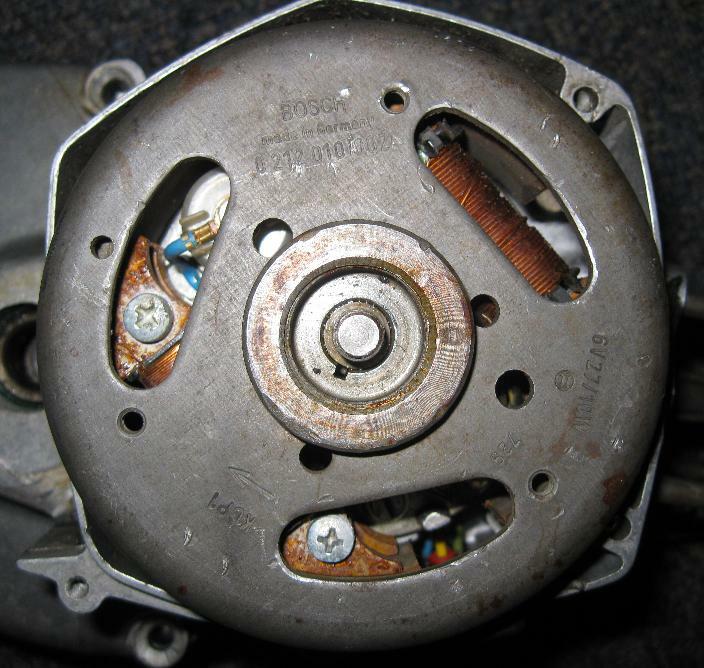 A pile of used moped stators can be sorted by grommet type, which is engine type. 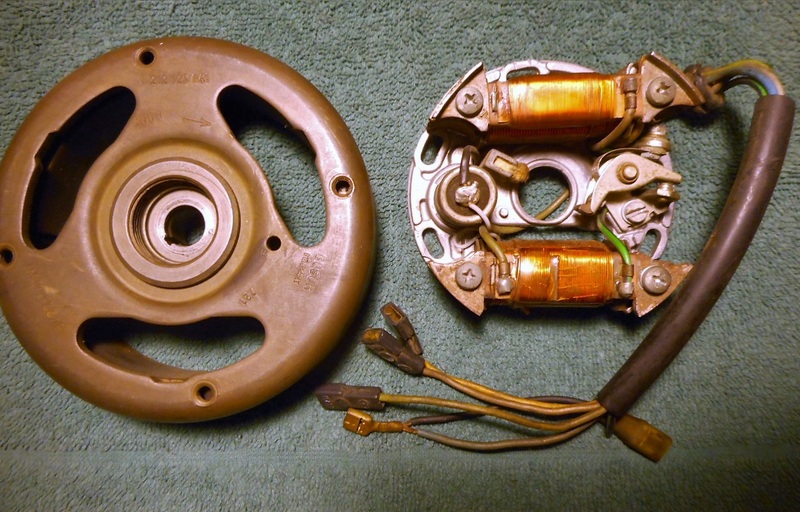 The ones missing grommets can be matched to the grommet ones by stator part number. This is done without any books or manuals. Specifications, illustrations, or part numbers from books, manuals, internet photos are additional forms of ID. All forms of ID must agree. 1950’s-60’s had solder type condensers and no-wire points. The points-to-condenser wire was sold separately. 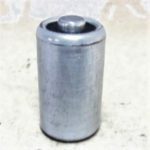 1970’s-80’s had screw-on type condensers and with-wire points. No more soldering. A solder-type can be replaced with a screw-on type, by adding eyelet connectors to the wire ends. 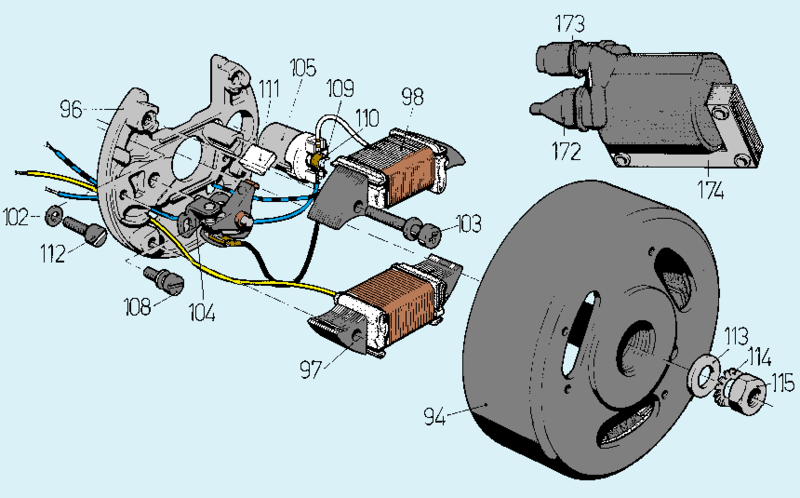 All of the Bosch magnetos listed below are the internal ignition ground type, unless noted in bright blue. This flywheel has a separate points cam. The points are the early no-post type. 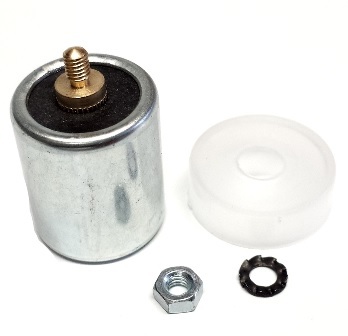 The points pivot post is screwed into the stator base plate. Unscrew it to make the normal points fit. This whole magneto was superseded by 0212-005-024. These are 50cc kids off-road mini-cycles, with no lights. But there is a lights coil. 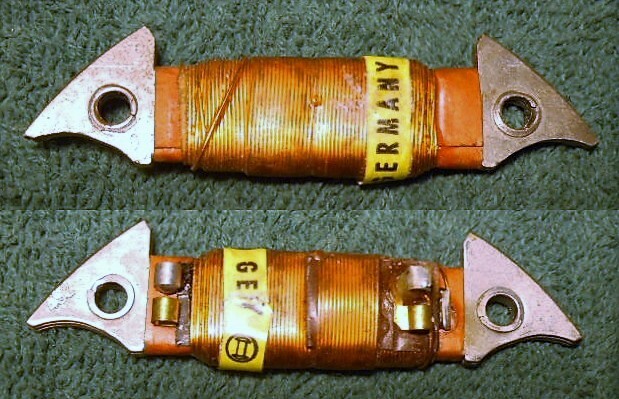 Sparta stators are 4-wire, 3-coil. 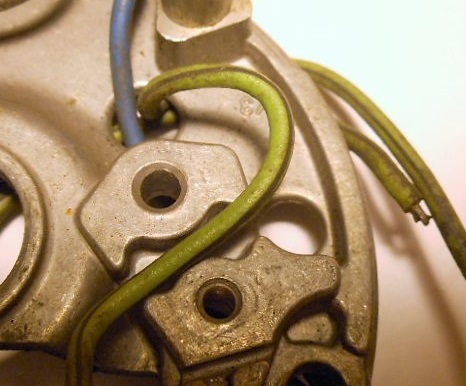 Top coils are (behind) ignition (blue wire) and (in front) brake light (green wire and green/black wire). 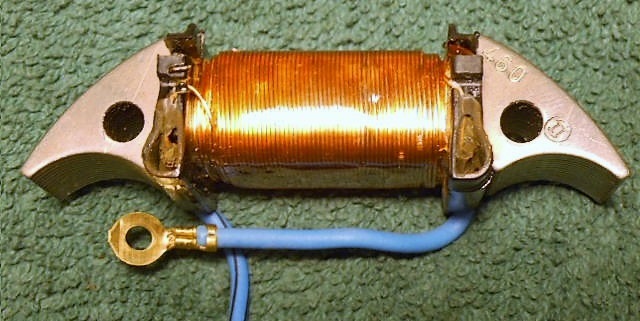 Bottom coil is lights (head light, tail light, speedo light, and horn) (yellow wire). 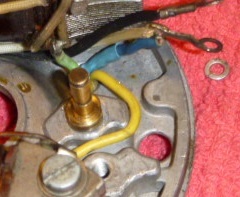 The ignition and light coils are grounded internally. 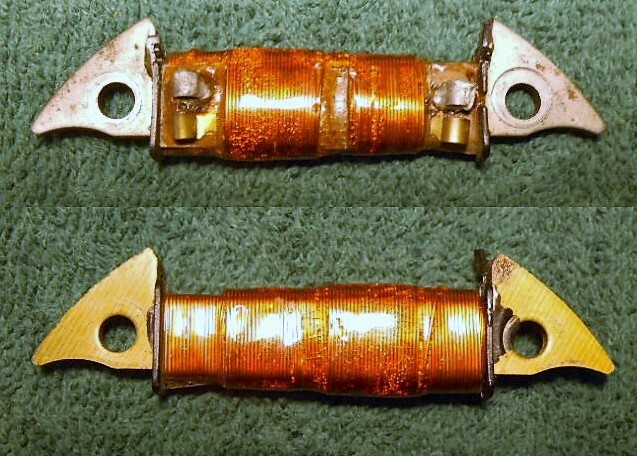 The brake light coil has an external ground. 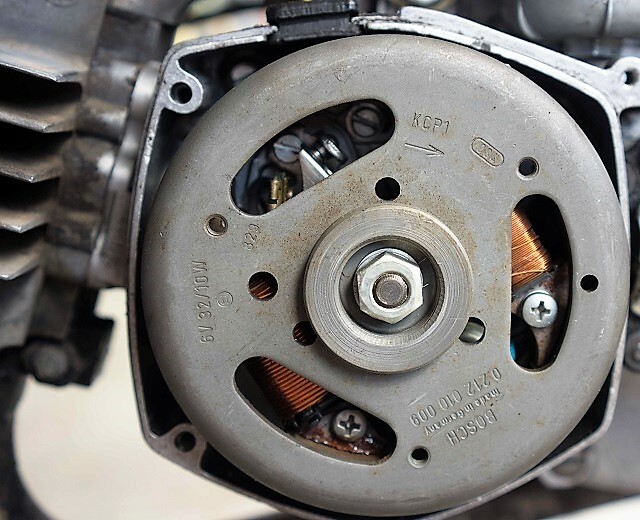 Because of the internal ground on the ignition source coil, the points continuity cannot be checked unless the source coil is disconnected. 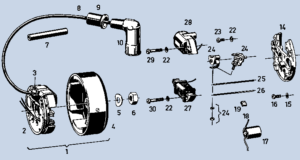 Bosch has provided a condenser with a screw-on nut with detachable eyelet connector wires, for testing the points for continuity. Otherwise, the ohms of the coil is almost the same as the ohms of the points. 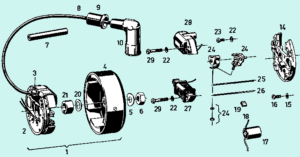 See Service/Electrical/Wiring Diagrams/Sparta Foxi for more Sparta wiring info. 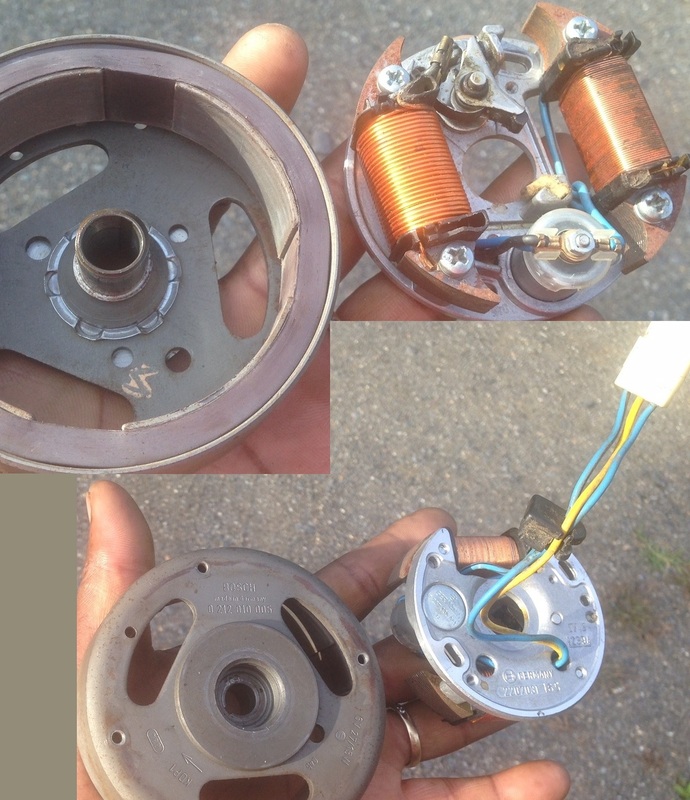 This Bosch 2207 031 161 Kreidler stator assembly is the same as a Bosch 2207 031 160 Sachs 504 stator, except for the 1-wire brake light coil. 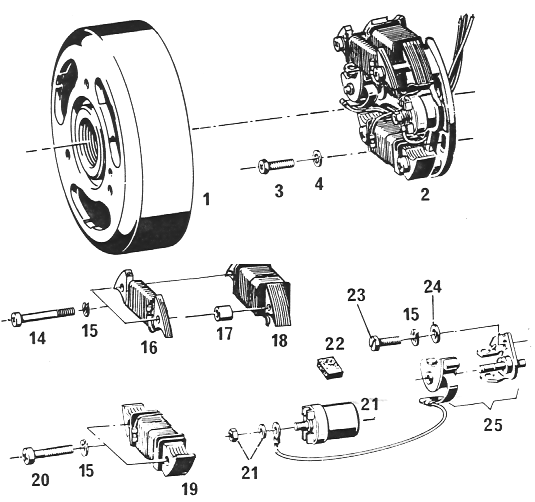 But the flywheel is very different. 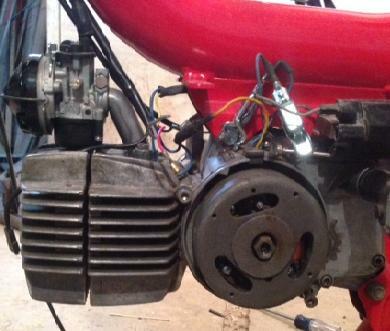 Use a 2-wire brake light coil for a Sachs 504, as a substitute for a 1-wire Kreidler type. The additional green/black wire must be grounded to the frame. 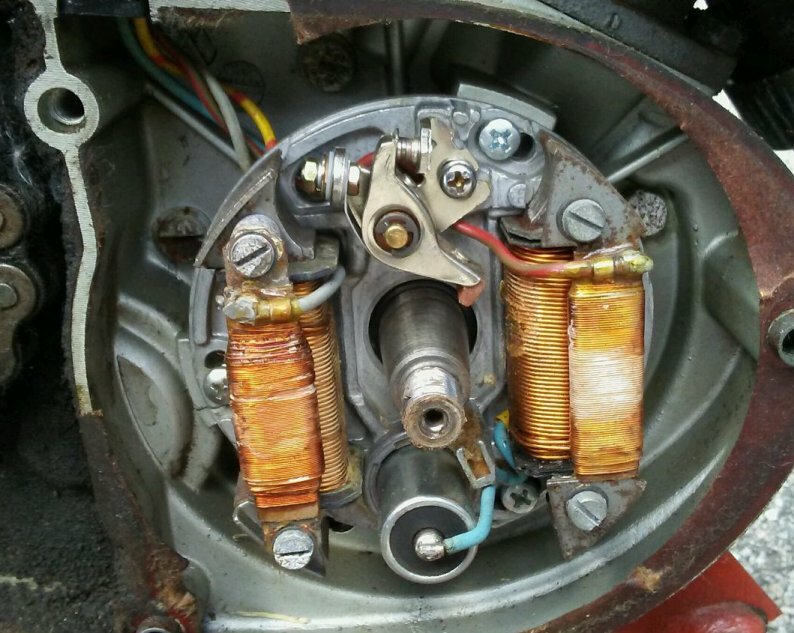 Because there were 10 times more Sachs 504’s sold in late 1970’s California than Kreidlers, the coils for Sachs are not as scarce. 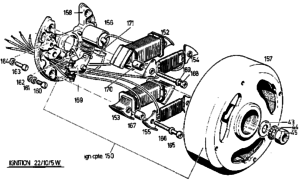 This 009 flywheel is the same as the more common 002. The lighting coils are different. 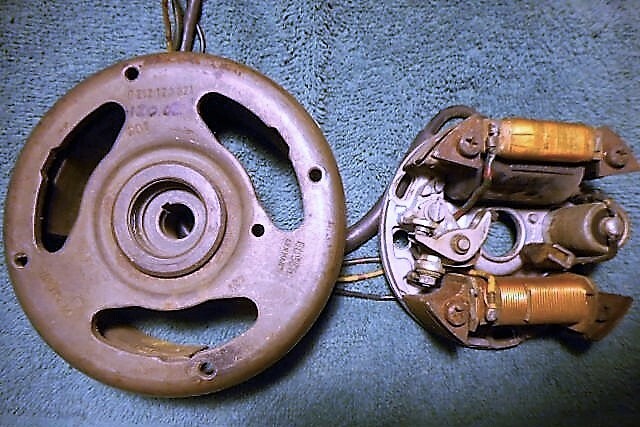 The lights coil has more windings, and the brake light coil has two wires, green and green/black, instead of just one green wire. This provided power for recharging the turn signal battery without dimming the other lights. Read more in Wirings Gallery, scroll down to “K” Kreidler. 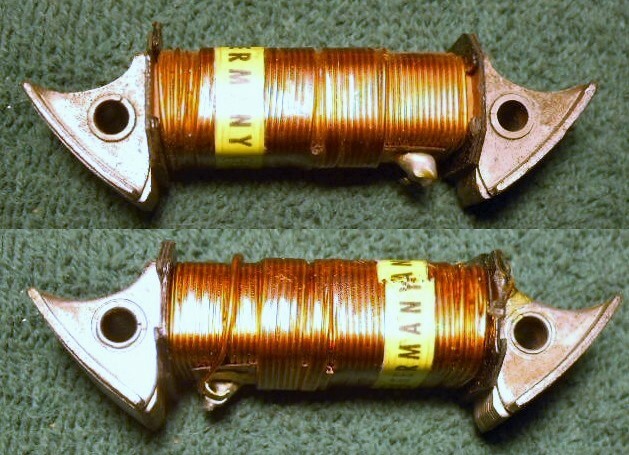 This 2-wire 10W generator armature 1214 210 462 is physically the same as a 2-wire one 1214 210 450, and can be a substitute. When changing from 1 to 2 wires, the additional green/black wire must be grounded to the frame. 1950’s-60’s had “early” points, no pivot post. The early pivot post was part of the base plate, but it unscrews. 1970’s-80’s had “late” points, with pivot post. These replace the older points, once the post is removed. 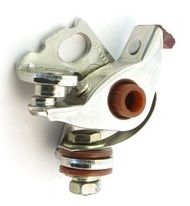 The early and late points have the same Laura part number, because the new parts replace and supersede. Either solder-type can be replaced with a screw-on type, by adding eyelet connectors to the wire ends. 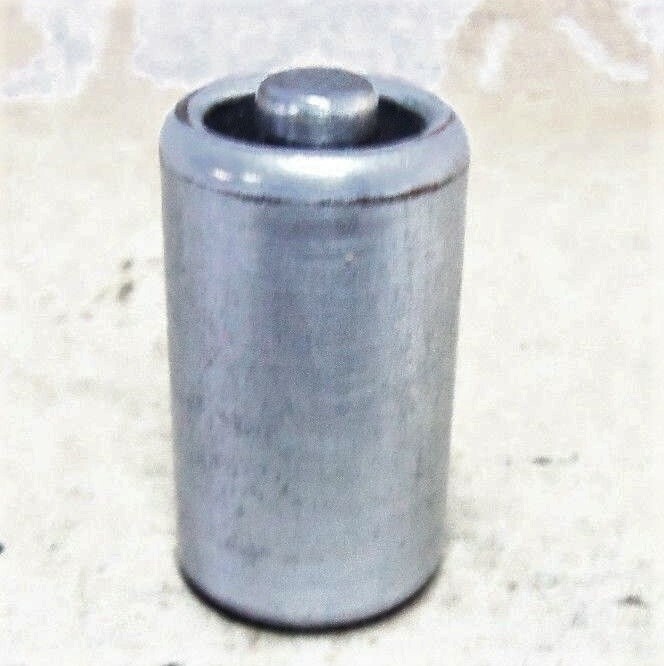 This solder-type magneto was superseded by 0212-112-095 (no-solder type). 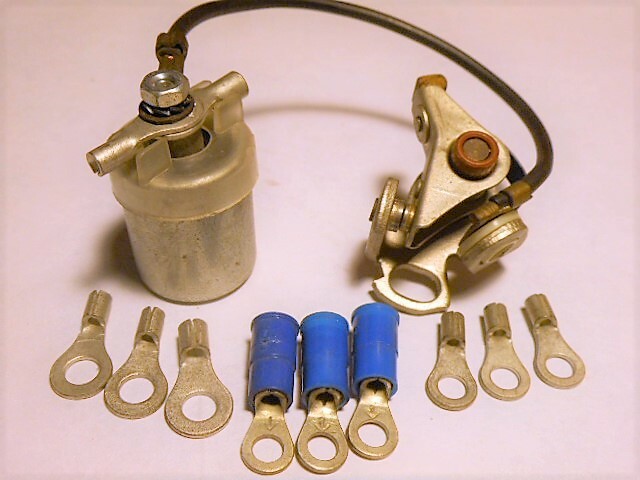 This solder-less magneto has eyelet connector wires on ignition coil and points, and screw-post type condenser. 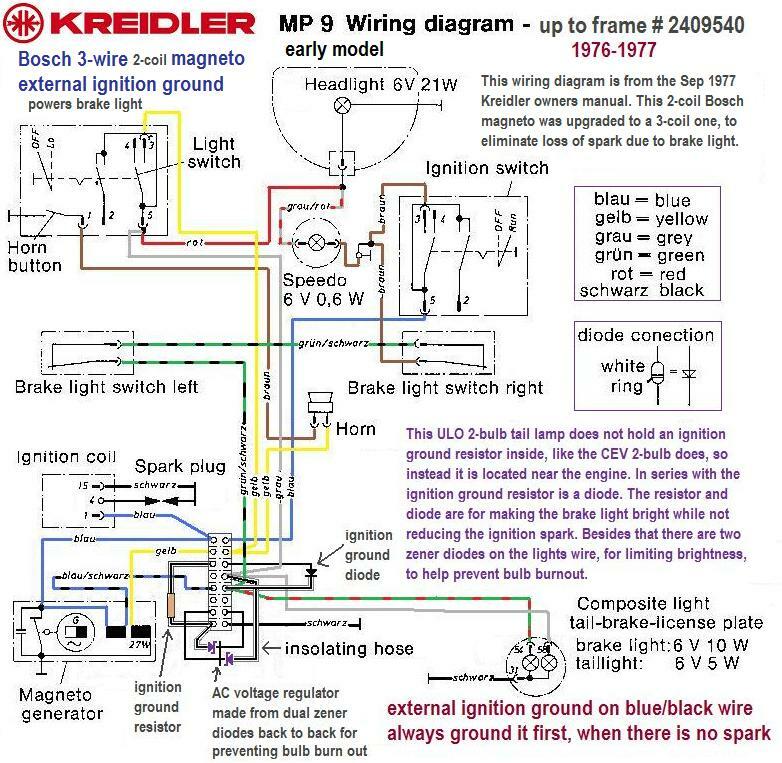 wires: black-ignition, yellow-lights, green-brake light?, lilac and lilac/black for battery? 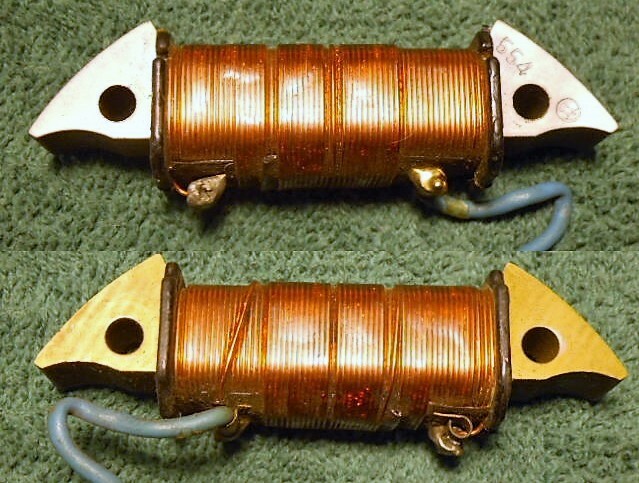 These have 4 coils like tha Laura one above. 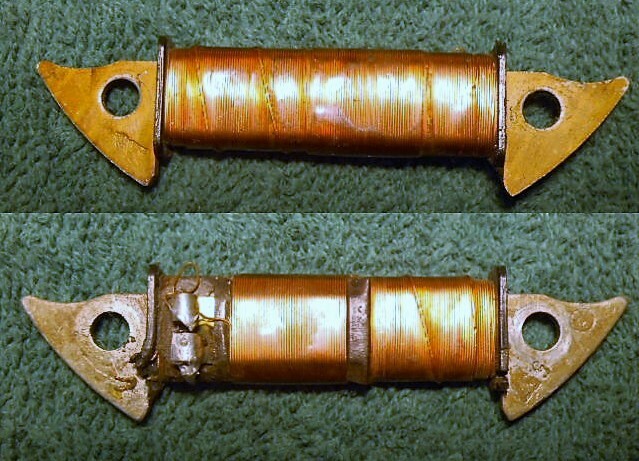 The ignition coil is also the transformer (spark) coil. 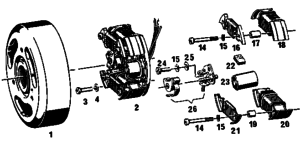 The Sears Allstate Parts Manual is where this specification and illustration are from. 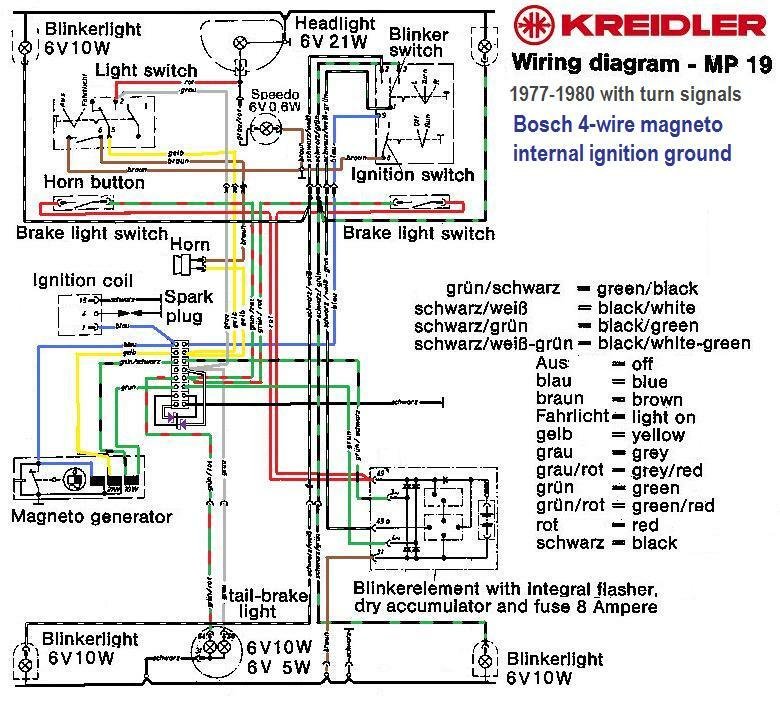 It lists the light bulbs: head 6V 15/15W and tail 6V 2.4W, brake 6V 3W. So the magneto rating must be close to 6V 17/3W. 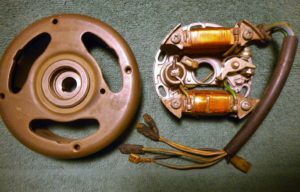 Notice how the 1972-75 Batavus magneto 0212 120 021, shown below, looks identical to this. 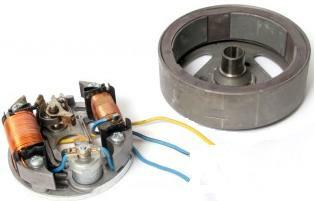 This early Puch stator is identified by the grommet. 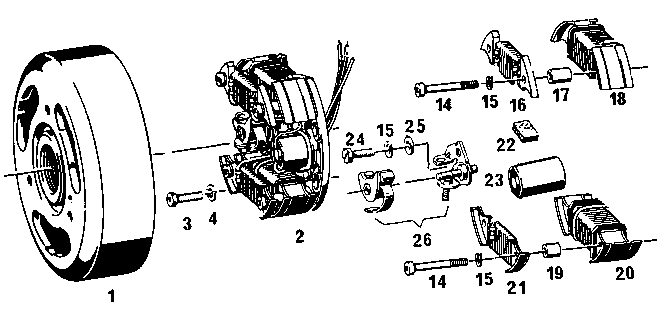 The ignition coil is missing. The small lights coil is on the bottom instead of top. 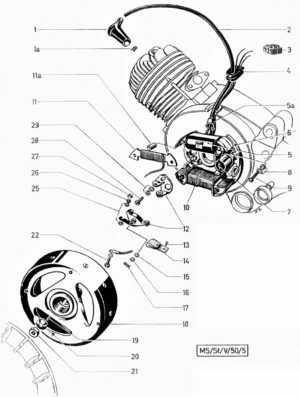 1954-68 Sears Allstate 50cc models Mo-Ped, Campus 50, Saber, and 60cc models Sport 60, Cheyenne, and Motor Scooter, had these Bosch magnetos, or ones like these. 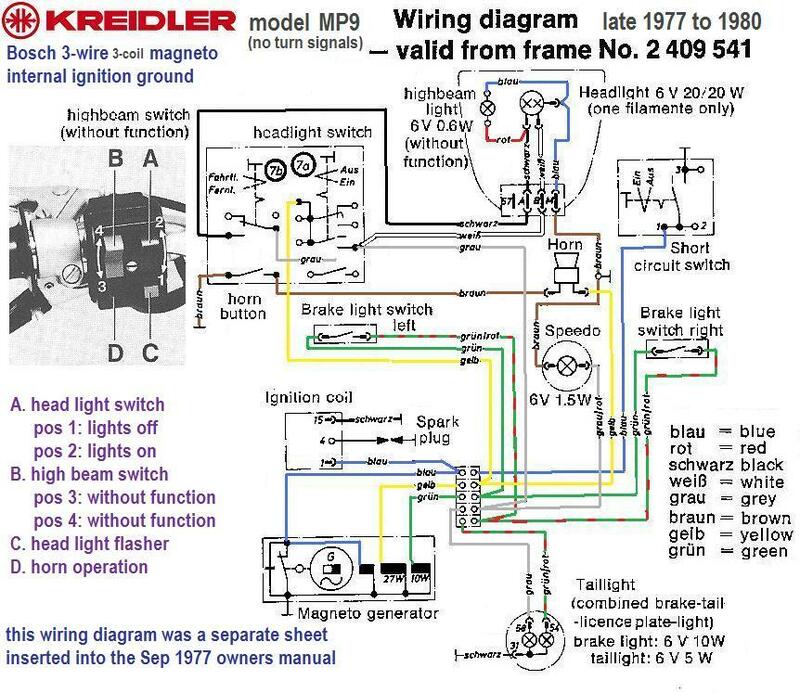 The Sears Allstate Service Manual says the bulbs are: head 6V 25/25W, tail 6V 3W, brake 6V 5W, and the magneto is 27 watt. 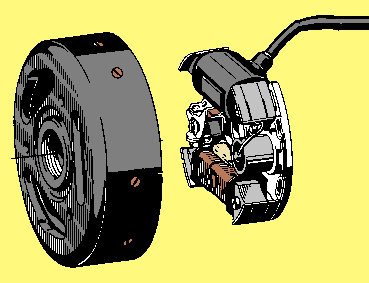 Here the flywheel is shown with the fan blower installed. You can see the center of the flywheel and the windows are different. New items have bright green prices, used have dark green. N/A means not available. All 3 condensers have the same diameter Ø18. So a short can replace a tall type, and a screw-post can replace a solder type. 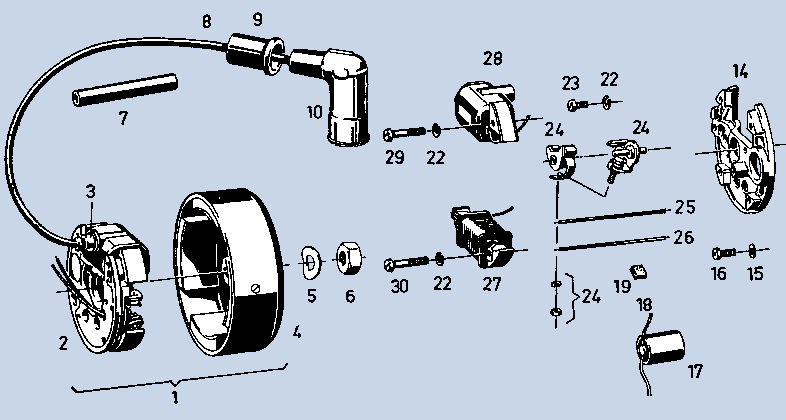 They all interchange, except for the tall type, which only fits “big” Bosch Ø90 magnetos. “no plugs” means no connectors on the wire ends. They attach to a screw-terminal strip, instead of plugging in. These have good wires. But some cost $10-$20 less, because the wires are cut or damaged. Points are not worn out. Everything is cleaned, prepared and tested. Condenser is good, as are coils and wires. 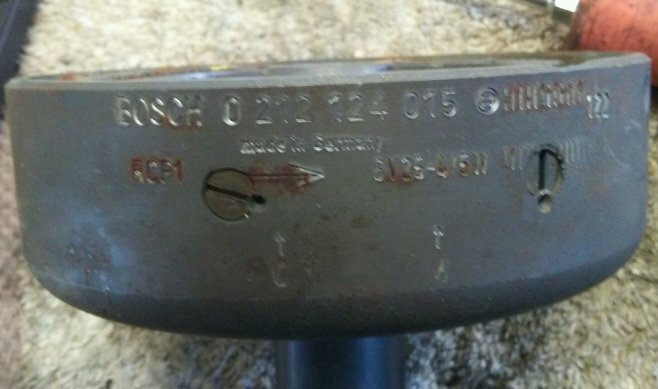 0212 010 001 flywheels: Several individually numbered Bosch magneto flywheels for Sachs 504 engines are offered for sale below. The focus is on the condition of the surface of the points cam. All of the flywheels are otherwise straight and with a good woodruff key groove. 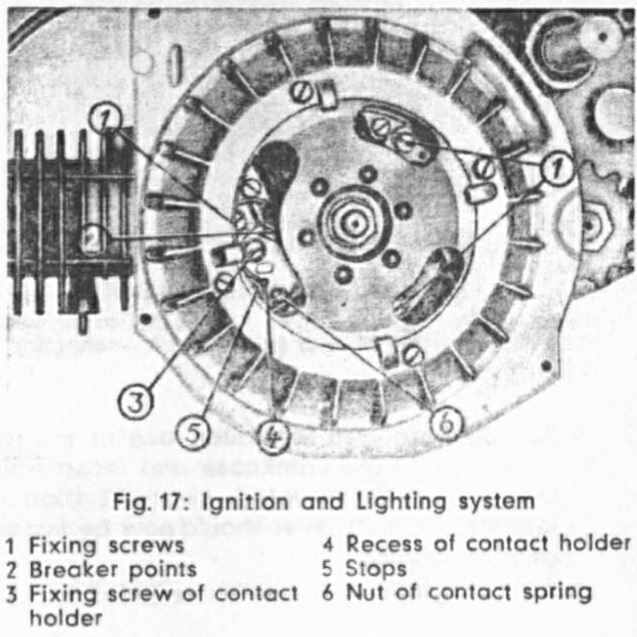 The flywheel rotates counter clockwise, viewed from it’s outer facing side. 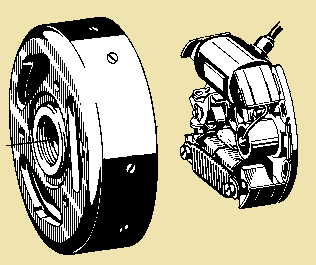 Two views, 180 degrees apart, of each flywheel are shown below. The “A” side is the upwards ramp that opens the points. 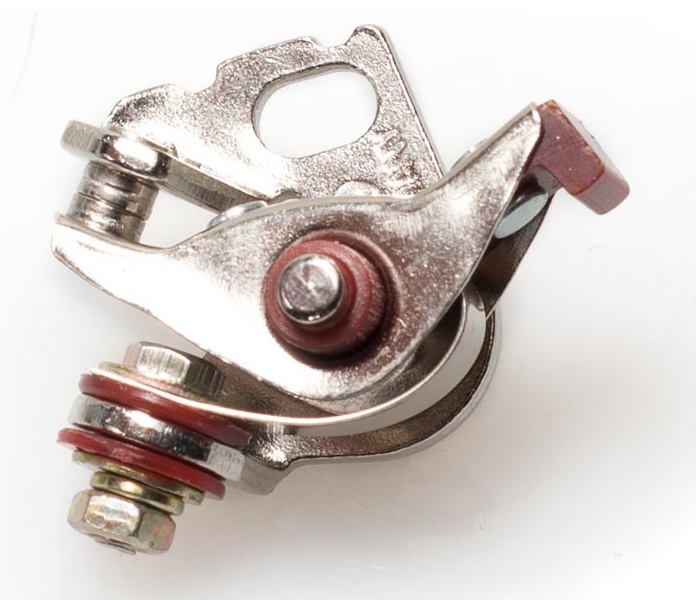 This is where the most wear occurs, and where the most smoothness and precision are needed, or else the points rubbing block wears down prematurely. The “B” side shows most of the key groove. Any rust has not been cleaned off yet, but is not a problem, other than rust on the outside surface of the points cam. Flywheel 1: $20 The cam has been cleaned. Rust pits visible at the top of the up ramp. Click to enlarge. Flywheel 2 $80: The cam has been cleaned. Never mind the orange rust. The cam surface is all good on the outboard side of the points rubbing block lane. But it has some pitting near the top of the up ramp on the inboard side of the “lane”. Flywheel 3: $10 The cam has been cleaned, but needs extensive sanding and polishing. It’s rusted bad. Flywheel 4 $25: The B side has not been wiped with steel wool yet. 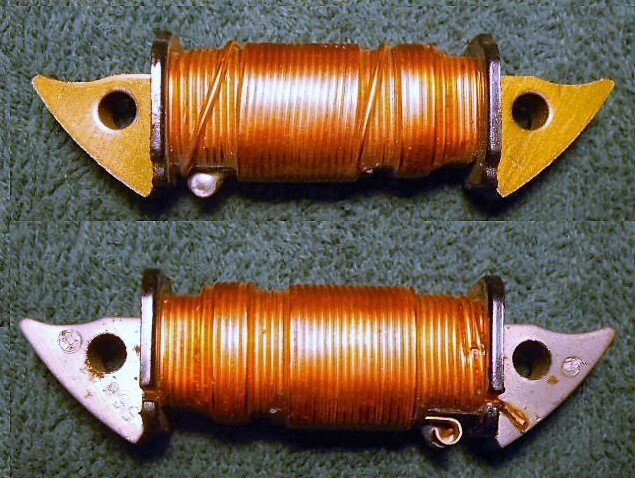 The A side has rust pits all across the points “lane”. There is one original smooth area, that is dark from a reflection. The whole cam would need to be grinded down by the same amount to preserve it’s shape. This can be done with little high-speed sanding and polishing drums, but it’s difficult and it comes out a little (or a lot) lumpy. Flywheel 5 $60: It has not been cleaned yet. Looks like it would “clean up” good, with steel wool, then emery cloth(s) and polishing. Side A shows pits in the middle of the plateau. So the whole cam has to be sanded down evenly, then polished smooth. Flywheel 6: $150 It has not been cleaned. You can see it’s a new one. 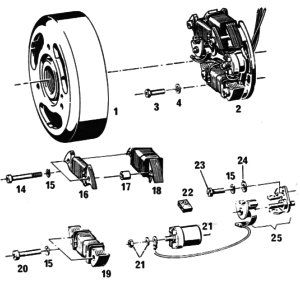 Flywheel 7 N/A: It has not been wiped with steel wool yet. Side A is rusty, but it does not look that deep. It should be cleaned and inspected then. Side B is fine. The orange areas are just surface “stains”, not pits. Flywheel 8: $130 It has not been cleaned. Yet it’s clean and almost new. Notice side A where the points rub the hardest against the cam, where it’s shiny and dark (a reflection). That is the (opening) up ramp and the start of the plateau. Side B has no signs of wear, meaning that the points don’t rub very hard in that area.